How the kitchen looked before we got started. Before we could get to work on removing the post, I first needed to clear the area and remove the old ceramic floor tiles. This was super easy, because the thinset was old, cracked, and hadn't adhered well to the wood floor. It was interesting to see what was underneath the tile. You can see on the floor, where walls used to be. A wall once existed where the edge of the tiles now is, on the right side of the photo. The yellow arrows point to where a door used to be framed out. 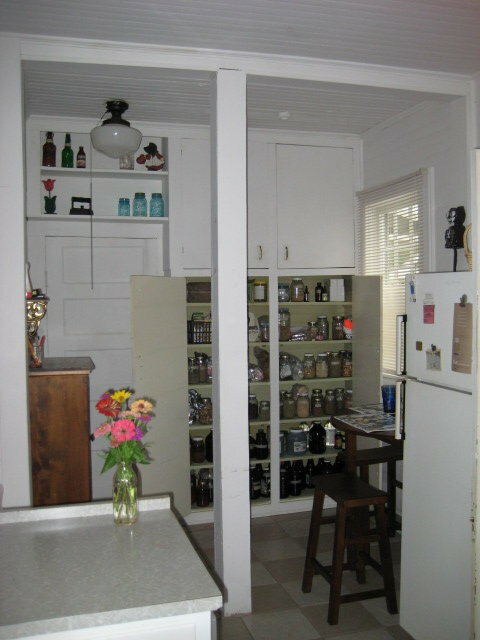 My guess is that this was a once-upon-a-time pantry, which would have made the original kitchen a square of 11.5 x 11.5 feet. I can understand why they'd want it bigger. Tearing out that old pantry enlarged the kitchen from 132 square feet, to over 173 square feet. Quite a bit more room, but since one of those walls was load bearing, the post was left as both functional as well as a "decorative" feature. It did look kinda neat, but boy was it ever in the way. That's a tongue-and-groove hardwood floor underneath, but it's the only floor. There is no subfloor. In fact, where the wall used to be, you can see down into the crawl space, because the walls were built on floor beams instead of a subfloor. The next step was to take down all the trim that covered the post and the original ceiling beam. I don't know how well you can tell in the photo below, but the original ceiling beam turned out to be two, 2x4s spiked together. Dan decided he would remove the original beam's bottom 2x4, and leave the top one in place. The new beam will fit up against that one. We were concerned about drying time for the beam, until we realized there was no sap in it. Unusual for pine. It was cut from a tree that had been dead for some time. It had fallen, but instead of landing on the ground, it got hung up in the neighboring trees. Because of that, ground moisture hadn't rotted it, and it had cured on it's own. Dan cut it to size, then sanded and stained it. Before we could remove the old post however, the ceiling had to be supported first. 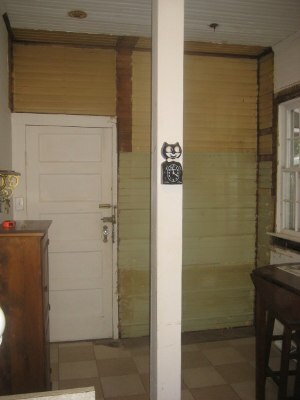 Dan used two fence posts to do this, placing them next to the original ceiling beam. The sheet was to keep at least some of the dust out of the rest of the kitchen. It did help actually. He wanted to check the beam length, to make sure it was cut correctly, so he nailed two temporary 2x4 supports to the wall posts. You can see them against the walls in the photo below. We then rested the new beam on these. Testing the fit of the new beam. Perfect. At that point it was not bearing any of the load, so the temporary support posts were left in place (they are actually behind the new beam in the above photo). We left it there for several days, to adjust to the house temperature and humidity. In the meantime, Dan worked on the permanent support posts. More on that in the next post, Kitchen Remodel: Beam Up, Post Down, Part 2. Man you guys are busy!! I love the 'how to' aspect of this post. I am looking forward to seeing the project proceed. Oh! eso es mucho trabajo. It's looking great!!! I can't wait to see the end project. WELL DONE DAN ! And you who did all the other work like cooking meals where ?! You two sound like agreat team. Can't wait to see the finished room. Wow! You guys are so tallented and industrious. I'm learning a lot, even through I will probably never do this myself. If I have to have someone do this sort of thing for me, I will know if they are doing it properly or not. Oh no where is the Kit Kat Clock going to live???? Gosh you are going to be happy to get that post out of the way. It should make the kitchen seem bigger just because that post cut your line of site. Cool! I'm impressed at being able to use the pine - for all the reasons you mentioned, it shouldn't ever warp. What a find! All that hard work looks very worth the extra elbow room you're getting in that space. Fascinating post. Love all the progress shots and details. Love the look of that beam. And what a conversation piece too. you guys are coming right along on that place! SEems like you've constantly got a project going on! I think its really neat that your able to use the resources on your place, such as the fallen tree for the beam in the kitchen! Makes it more meaningful and memorable! So glad to see progress on your kitchen, the heart of your home. I'm just catching up... so sorry to hear about Chipper. To everything there is a season, dear. Many thanks to everyone for your kind comments. I am still trying to get my home computer online and am making a quick check of my email and blog at the library. Hopefully soon I can have the time to address your comments and questions more personally, as well as get caught up on blog visits! I appreciate each and every one of you. I'm wondering if your new finds will mean a change in plans to the floor...putting in a subfloor? Looks like the ceiling might need some beefing up as well. Hugs! I'm always amazed at how poorly some houses were put together. or changed. We had a few years back someone in town had bought one of the historical homes to have a business in. They decided to take out a wall and unfortunately didn't do their homework...the house caved in. Our town now has one less historical home. I am jealous of you removing that beam. I have one, too. My husband built (rebuilt) our log home and insists that the top floor will come down without the beam.